Mr. F turned 4 this weekend. With all the family and friends, he's having 3 birthday get-togethers. The first was Saturday night - breakfast for dinner, with fruit, puffy baked pancake, sausage, and of course, a cake. The big hit of the evening was a Lego loading dock, complete with M & Ms to load, unload, and share, designed and built by Uncle Gerry (wearing glasses). The big and little boys were equally enthralled. Our boat normally lives on a trailer on our second driveway. It looks awfully big there and draws some attention when driving down the street. On Saturday morning we launched it for a short trip to a marine shop where a new engine will be installed. The old one (40 years) still works well, but for how long? We're planning longer trips and to more remote areas and want the extra security of a reliable engine. As a bonus, this new engine will be quieter! The weather wasn't the greatest on Saturday morning, but soon cleared up. Sunday afternoon skies shone blue and clear. How I love these brighter, longer days. I have more energy to plan and do things. A wander around the garden with my camera revealed lots and lots of life springing up in the garden. 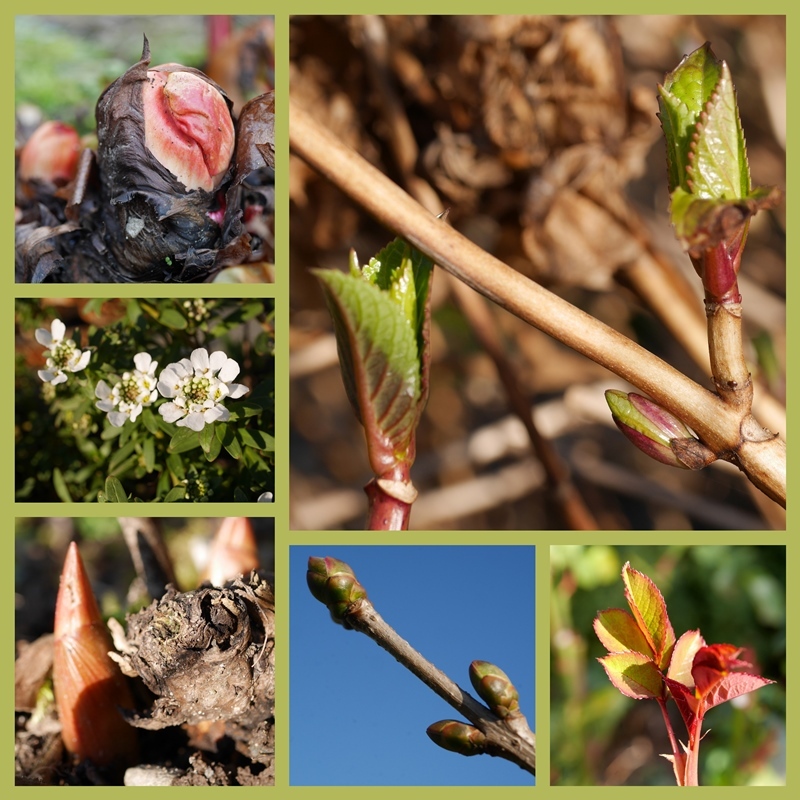 Rhubarb, hydrangea, peony, lilac, and rose bushes unfurl in response to the season. White Candy Tuft begins to bloom. This winter has been extremely mild, as evidenced by the parsley plant that hasn't died down. I've been able to clip from it all winter. Now the chives are poking up, and soon oregano will show new growth. The garlic I planted last fall is 3 inches tall. Kale plants are yielding a wealth of leafy greens. It could still get cold, and possibly snow, but as the days pass, the likelihood lessens. Are there any signs of spring in your corner? Good idea on the boats motor...quieter sounds good. You found lots of Spring hope in your yard. I was happy to do some clean up out in the yard in sunshine over the weekend. Woohoo! Happy to see the sun shining beautifully today, too! My boys are all grown up but they still love to play with Legos! lol We have some beautiful blooms on the Maple trees....and POLLEN already! Enjoy your afternoon! Hugs! Big boys and little boys never tire of legos. Nephews and sons are a good reason to keep building! Happy Belated Birthday to Mr. F. His cake looks delightful! The longer days are energizing me too. Always lovely photos. Mr. F is 4! Wow! I’m longing to see growth in the garden! I imagine that the Lego loading dock kept all "the boys" quiet for quite a while, what a great gift from Uncle Gerry. Like you I'm seeing daily signs of new growth in the garden, chives, rosemary and thyme are all thriving in my herb garden but sadly not the parsley. I have parsley and cilantro seeds ready to propagate as soon as the weather improves. Looking forward to seeing more of your boating adventures soon. 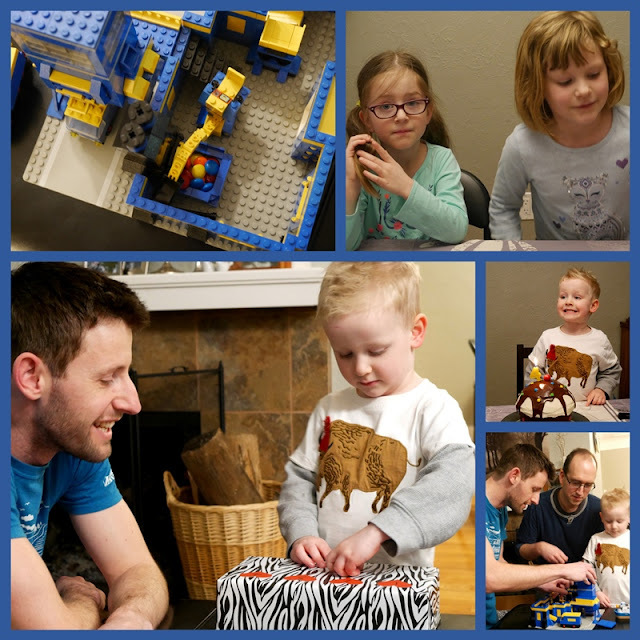 Beautiful photos, what fun for all the boys to get involved Lego the perfect gift. Love all the signs of Spring you shared and yes shoots are definitely starting to break through the soil. Happy belated birthday wishes to Mr. F! You certainly have signs of Spring, Lorrie. We have had an exceptionally cold winter here in Texas, but I never mind. Summer comes all too quickly! No spring here. :( My husband is sure hoping no more snow too as it really impedes farming and calving. My girls are still ready for more though. That lego loading dock is so great! Kudos to a great uncle. My kids really love (loved for the older ones) legos but never veer too far from the plan that comes with each box. Lego is one of the best! I can't believe your Parsley! Mine is still sulking. Hope you have some wonderful travels in the boat when it comes back home to you so you can get away from home and have fun! Glad to see your signs of spring, we are still waiting for them here other than the snowdrops! I love your comment about each of us connecting with each other on our blogs. I Find it joyful. I love seeing the COUSIN? wait and watch for the birthday boys gifts to be opened. So many memories of those times as my kids grew up. NOTHING growing here. Tons of snow. Its pretty. Mr. F has grown so much! He is a handsome little fellow! Uncle Gerry probably was glad he had an excuse to play. I am jealous! My plants are still asleep. I can’t wait for them to wake up. No signs of it here. Snow, snow, and more snow and treacherous ice on the sidewalks and driveways! And no real hope of it for weeks and weeks to come!! Glad you're enjoying those first signs of spring and the promise of boating soon. Legos are an all-time favorite! The Legos bring back such delightful memories of those years with our son. I was always the piece sorter when he got a new Lego set! But we never had M&Ms as part of the deal! The cake looked amazing - did you make it? I am jealous of your garden, especially the rhubarb. No signs of spring here - current winter weather advisory calling for 4 -7 inches between tonight and Thursday lunchtime!!! Kids loves legos! And M&Ms, too. Lucky birthday boy. Four is such a fun age. No sign of spring here. By tomorrow what snow is on the ground will be melted away just in time for the snow expected this weekend. Love the daffodils, as always. Oh, you're making me think I should plant a herb garden. Fun to celebrate with family! And yes, today I saw the rose bush is letting out signs of spring and there are tiny tips showing up all over the plant island. It's so interesting how a few days of sun change things. Your signs of Spring are similar to our signs in the garden. How I love seeing those little sprouts. What a wonderful Lego gift, my grandsons favorite. Happy boating! We are hoping this summer to take a big boat up through the inland passage to Alaska. Right now we are dreaming, but soon I must get serious about plans.